Fossil Cycle: One problem I see with these, is that without something like Trample, or other form of Evasion, these could be overpowered in a set with ability-less creatures. Goblin Grabber: I like the Magnetic Theft ETB effect, but there's no reason it should die when unequipped. I would not complain if it was a red Kor Outfitter. Goblin Spell-Snatcher: Compare that card to Mogg Sentry. It does not make for easy math when the creature is a 1/2, then a 3/3, then a 5/4, 7/5, and so on... Give the creature equal power and toughness, and get equal power and toughness from his ability. Simplify the math for the players. Grand Sabertooth: This card would define a new level of power creep: 1-mana for a 2/2. 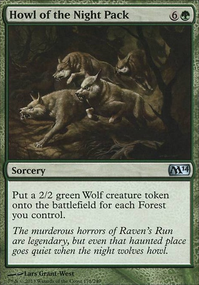 The problem I see is that no player would ever choose to have a Tundra Wolves when they could have Isamaru, Hound of Konda (even better because it's not legendary). Gravewarden: When I think of Muraganda, I'm imagining a primitive world, with cavemen, and wild animals. I don't imagine there are any societies on Muraganda organized enough to have a religion and a Cleric, and grave and death rituals. I suppose this same thing could be said about some of the other Shamans and Wizards in the set, that without being a part of Daelin's tribe, they're a little out of place. Could this card be salvaged with a different name and creature type? Grip of Tar: In a set dependent on creatures without abilities, a 1/1 with Deathtouch is effectively a removal spell. This card is a 2-for-1. Not unlike Consuming Vapors, it should only hit creatures, though. Heavy Cumulus: Should read like Vines of Vastwood so the creature doesn't get an ability. Holistic Wisdom: It's like Bred for the Hunt or Secret Plans, but much worse. Ivory-Tusk Stampede: Should be sorcery, like Martial Coup. March of Mediocrity: Seems to occupy the same design space as Muraganda Petroglyphs. Master's Whip: Should be phrased as "whenever equipped creature attacks" so the equipped creature doesn't get an ability. Mind Devourer: Is his ability "instead" of doing damage? Or "in addition" to doing damage? If it's "in addition" the ability is useless, as he'll kill an opponent through damage long before he mills them out. If it's "instead", then it's just really bad. But, the even bigger problem, is that I'm not sure this is the set this creature belongs in, as Muraganda seems like a primitive world that wouldn't support a magical ecosystem where thoughts are abundant food. Most of this world's inhabitants are feral creatures and cavemen; not nearly the food supply for such a creature. Mindleech Conch: I could nitpick this one, but honestly, I'd want to see how it played. It would kill an opponent by damage before its milling was relevant, but its "draw 2" when it hits is insane. And 3 power is pretty good, it stands up to most removal in the set, except the 1/1 deathtouchers. Sidenote: On the subject of 1/1 Defender Deathtouch Ooze tokens, I feel like this set needs more of these as "removal" (Flash Foliage comes to mind as a template). These tokens would make combat quite relevant, and give the opponent a ~real~ incentive to choose an ability instead of the vanilla creature. 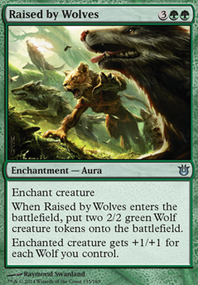 It occurs to me, that a focus on removal of this type could make Tundra Wolves better than Isamaru, Hound of Konda, and I absolutely love that idea. As flavor, Muraganda seems primitive, so, the 1/1 Defender Deathtouch Oozes, traps and fights seem like the kind of removal that would be abundant on this world. Nesting Grounds: Awesome card. I was hoping to see another 4 cards like this on theme. Some sort of "Daelin's Cave" in Grixis colors, or something else. If there can't be a cycle, (like Crypt of the Eternals) there needs to be a story to explain why not. Oaken Club: Perfect equipment for this set. Orb of the Masses: I think this would be one of the few times giving creatures abilities would be good. "Legendary" prevents (experienced) players from using it, then playing another and using the new one. In my mind, the first ability would say "whenever a creature with an ability enters the battlefield", and it should have an imposing presence like the monolith from 2001: A Space Odyssey; the stone that begins the next phase of evolution. It could be like a small choose-your-own-Akroma's Memorial. Planar Lens: This is not the kind of equipment I'd expect to see on Muraganda. It seems too intellectual. Primal Instincts: Nice art. Costing 4 is out of the question for something that can't kill opponent's attackers or replace itself. I'll point to Righteousness and Hold the Line, and To Arms!. Primal Return: ironically Primal creatures don't count as creatures with no abilities while they're in the graveyard. Primordial Pools: could probably be better with an ability more like Ooze Garden, since Deathtouch is basically removal in this set. Pulop, the Planar Sentience: The artwork and name conjured up a totally different idea of what this card should do. The art depicts a slime devouring a man, and the name implies the slime duplicating the man. Let me just spitball this idea at you: +1: Create a creature token that's a copy of a creature ~ exiled. // -X: Search your library for a creature with converted mana cost X or less and exile it. // When ~ enters the battlefield, exile a creature card with converted mana cost 1 or less from your graveyard. Pulop's Chosen: This might be too much power creep. Nim Abomination has the same stats as the Primal version. Radiant Purge: Good sweeper for this set. Gleeock Thanks for the kind words, its everything I was aiming for in this build. I love the token sac for tutor mechanic, the value is too good, and I want to look for more interesting pieces to add into my tutor chain as well. NV_1980 I really appreciate your feedback, you've helped me immensely on this deck. As for your recent suggestions, there will be changes at a later date. But as of right now this deck was built with a specific game in mind: Star, Pentegram, or Color-War (whichever you prefer). That's why Guardian of the Guildpact and Black Ward are included, as I know what colors my opponents will run and everyone is using mono-color decks. Those will be replaced after this specific game is played. Axis of Mortality is also in there for that game because it will allow me to not only to protect myself, but also aid my allies in a pinch. It also pairs nicely with a win condition involving Phyrexian Unlife + Solemnity . Odric, Master Tactician and Tundra Wolves are just personal favorites of mine and I can't bring myself to cut them. I'm taking your other suggestions under advice currently. Crovax, Ascendant Hero: you are regularly wiping boards AND you have creatures who are already strong by themselves. That makes adding this card a bit moot, really. Dragon Hunter: a wall against a single dragon or a creature that is unblockable in a deck that just uses dragon creatures. That seems like waaaay too specific a card to use. Guardian of the Guildpact: has the same problem as Dragon Hunter, though it is slightly more powerful. In the end, this is just a wall against mono-colored creatures/spells or an unblockable creature against opponents who only use mono-colored creatures. The variation you come across in EDH is just too diverse to make such cards very useful. 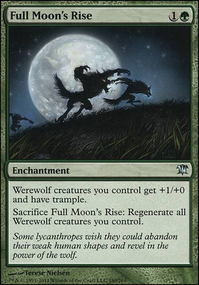 If you made this creature part of a deck that is specifically made to benefit from unblockable creatures, it would be another matter. But in this deck, I think it just takes up valuable space. Odric, Master Tactician: Odric's ability does not seem all that useful to me in a deck that wipes the board every few turns (or even every turn). Tundra Wolves: why is this in here? Just as a cheap creature to summon in the early stages of a game? In that case, I would really recommend something more powerful like Mother of Runes or, if affordable to you, something like Serra Ascendant or Weathered Wayfarer. Wakening Sun's Avatar: As this deck is about wipes, I understand why you would add this. Considering the current popularity of Ixalan though, I would not recommend it. Players using dinosaurs will not be affected by this wipe. I think Magus of the Disk would make more sense. Axis of Mortality : Am I correct in assuming this has been added as an insurance policy of some sort? Since your main strategy consists of wiping the board of creatures, the only consistent way other players will be able to whittle down your life total, is by using (targeted) spells. Considering that, I think it would be more useful to add Aegis of the Gods or Leyline of Sanctity instead of this card. Combined with Avacyn and your wiping abilities, this make you very difficult to defeat. 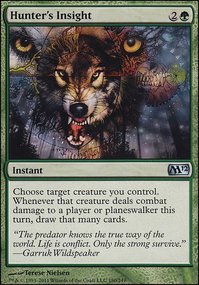 Pacifism: in a deck that often wipes multiple creatures, I question the use of a card that puts only one creature out of action (Swords to Plowshares seems more useful in this regard; just remove the thing that is bothering you permanently). Approach of the Second Sun: adding this card to an EDH deck (in which you are only allowed one of these) without tutors and/or ways to draw lots of cards every turn seems extremely inefficient to me. Act of Heroism: I see a tendency in your deck to try and stop single opposing creatures in their tracks by giving one of your own creatures an edge (like protection or a buff to strength/toughness) over the thing it is trying to stop. Act of Heroism is one of the cards you do this with. My advice is to try and incorporate more cards that will allow you to stop all (or most of the) opposing creatures simultaneously. Even better would be to incorporate permanents that can do this all the time, because Avacyn protects those from destruction. This is why I advised you earlier on using stuff like Ghostly Prison and Norn's Annex. That's it. I hope my comments are useful to you. Please let me know in case you would post a third draft. Hello sir! What you have here is White Weenie, or more commonly referred to as "Death and Taxes". What this deck does is run cost-efficient creatures, boosting them with equipments and other spells, protecting those creatures, and stalling your opponent's game plan. Death and Taxes is run in every format in the game. The deck you have here is currently modern legal, but not quite modern competitive. However, that can be changed with some tune-ups to this deck, which I'll list in the next paragraph. 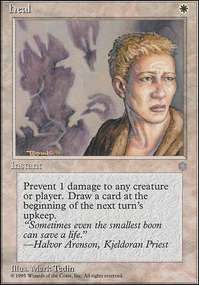 Swords to Plowshares is the single most efficient removal spell ever printed in Magic, but it isn't modern legal. You can take this deck with you into the world of Vintage or Legacy (again, with some tune-ups), or you could simply keep it a casual deck (which I still have suggestions for haha). Lets start with your equipment. Sword of Body and Mind is arguably the worst sword in the stone when it comes to legacy, modern, or vintage. The mill seems great, but decks running Emrakul, the Aeons Torn, Elixir of Immortality, Laboratory Maniac, or Blightsteel Colossus will make Sword of Body and Mind look just plain silly. Sword of Feast and Famine might look great, but protection from Black and from Green isn't necessarily something you need, depending on your meta. Sword of War and Peace has nice upsides as far as protection goes, but the second ability doesn't pack quite the same punch against most decks in legacy, vintage, or modern. What I would suggest is instead of running one of each, run 1x Sword of War and Peace, 2x Sword of Fire and Ice, and 2x Sword of Light and Shadow. Now we'll check out creatures. Most Death and Taxes lists run 4 copies of Thalia, Guardian of Thraben, 4 Mother of Runes (not modern legal), a couple copies of Thalia, Heretic Cathar, sometimes Savannah Lions, and other cost-efficient creatures. I like your use of Hidden Dragonslayer as a removal spell stapled to a creature. I'm not sure why Kytheon's Irregulars found a spot in here, and I would replace them with 2 copies of Thalia, Heretic Cathar for the tap effect and for a better price. 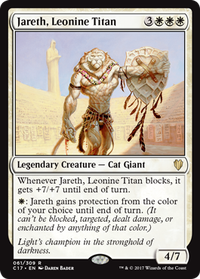 I see that Leonin Skyhunter and that's important, but it could be replaced by 2 Thalia, Guardian of Thraben if you want more bang for your buck. I can see how Puresteel Paladin and Anafenza, Kin-Tree Spirit looked good for the deck and I'm sure they're pretty decent, but they could be better. I would replace those with 3x Stoneforge Mystic (Legacy/Vintage) or 3x Mirran Crusader (Modern). The two Tundra Wolves should be replaced with 2 more Mother of Runes. Other Spells. Ajani, Caller of the Pride is a nice walker with great abilities, but not nearly as great as Elspeth, Knight-Errant for this kind of deck. Path to Exile is perfect for modern, but if you decide to go Legacy, it should be replaced with Swords to Plowshares. Dictate of Heliod, as I've experienced, is too slow and clunky for this deck, and takes away mana that could be spent on a creature that turn. I would replace the Dictates with a couple Crusade, the extra +2/+2 isn't usually that important. If you want to use the Dictate, it should be a 1-of in my opinion. Heliod, God of the Sun gives your creatures vigilance and that's awesome, plus he's a hard hitter once he's a creature. If you don't necessarily need the mana-doubler effect from Caged Sun, I would replace it with either another Always Watching , Dictate of Heliod, or Coat of Arms. Lastly, if Honor's Reward isn't too important, Secure the Wastes/Raise the Alarm would be great in this slot, as they have the potential to create 2/2's, 3/3's, and bigger with enchantment backup. From what you've built so far, you definitely have the right idea of how the deck works. Hope this helps! There is a round of priority after damage is dealt, but states will have been checked already, so it's too late to save your creatures by then. There's a way to kind-of do what you want if the creature has first/double strike. 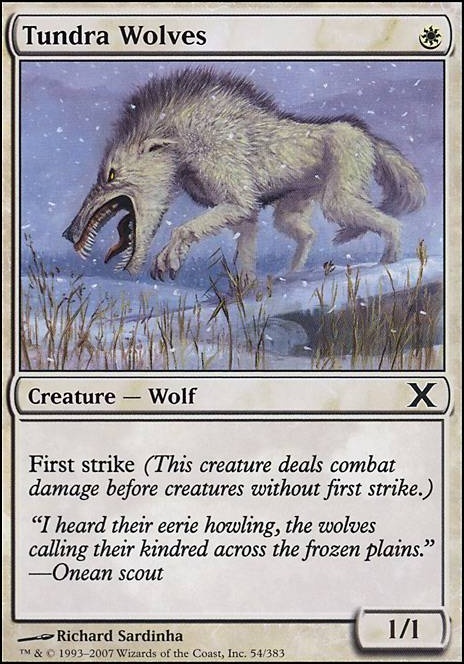 If you attack with Tundra Wolves and are blocked by Grizzly Bears, you can whisk them out of combat after they deal first strike damage with something like Otherworldly Journey, before they get hit by the slow bears. EDIT: Typically to save the creature, you cast the spell like Otherworldly Journey after blockers are declared.